Western Digital has announced the 20TB My Book Duo, the company's highest-capacity desktop hard drive ever. The storage system comes with proprietary RAID 0/1 support offering speeds of up to 360MB per second sequential reads, as well as auto management of drive operations to help ensure read/write cycle data integrity. The My Book Duo also comes with a USB Type-C port with all cables included for universal compatibility (USB 3.1 Gen 1/3.0/2.0), and two additional USB Type-A hub ports to allow for additional accessories, including drones, action cameras, card readers, keyboards, mice, USB drives or phone syncing and charging. Available in 20TB, 16TB, 12TB, 8TB, 6TB and 4TB capacities, the storage system also comes with password protection and 256-bit AES hardware encryption with WD Security software built in. The drive is Formatted NTFS for out-of-the-box compatibility with Windows 10, Windows 8.1/8.0 or Windows 7, and therefore requires reformatting to work on OS X and macOS. 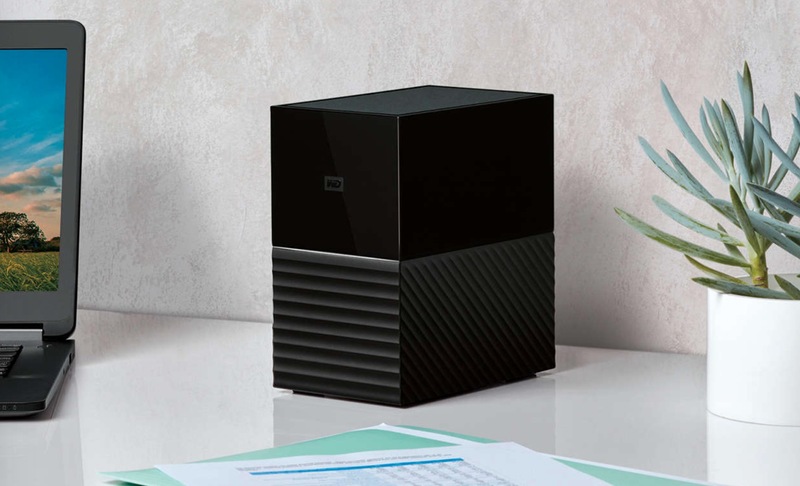 The My Book Duo includes a three-year limited warranty and is available now from wd.com and at select retailers and distributors, retailing at $799.99 (20TB), $599.99 (16TB), $419.99 (12TB), $329.99 (8TB), $289.99 (6TB) and $259.99 (4TB). for my residential and or office needs really looking for a network-able appliance to support common none SATA solid state memory (SSD). No need for RAID or SATA. the Western Digital box is too little too late. Another person who hasn't got the foggiest what he's talking about. Let's do some basic math. We're going to use US Amazon prices for the best comparison. For the purposes of this comparison we'll make it realistic so RAID 0 will be used, therefore two drives are needed. Keep in mind this storage is at best, limited to 1Gbps when accesses by an end user, so 125MB/s. Now lets try your SSD option. Since 2TB options are not yet available until later this year, we'll use the 1TB option. WD Blue 1TB from WD. OK, so we need 20 of these fellas, bringing us to a total of US$5,999.80! Not to mention the ridiculous rig you would need to hold all 20 drives in place, and the bus needed to plug it all in. I would estimate that would be at very least another US$1k but we'll ignore that for the purposes of this exercise. Using "spinning rust" as you eloquently put it, works out at US$45.60 per terabyte at absolutely zero performance loss against the SSD's in a real-world scenario. Your SSD set-up would cost 657% more than "spinning rust", and that doesn't even take into account the infrastructure needed for your great idea. Short of the long. You have absolutely no idea as to what you're talking about. When do schools start again? I Don't see the point of this things. Too bad for a enterprise use and too much for a home use. Plenty of home use. Great system that could back-up my existing 20 TB RAID 5 array. No GB LAN, No TB3 = Not a viable shared access storage solution for most applications. Bring SSD. Once you try it, you do not want mechanical rotational disks, even for free! This is rather short sighted, HHD is so much cheaper. Show me a 8TB SSD for $230 bucks. It's easier just to build a good Raid (preferably RaidZ) solution and if a disk goes bad pop it out and pop in a new one. Sure if all you need is 1-2 TB of storage SSD is fine if you direct attach the storage but most people will be good with a good NAS for backing up and doing work off of. Backup of a Raid 5, seriously ?? ** a month for 2 years on our easy payment plan. There’s an abundant supply of either short-sightedness, or ignorance on this forum today. Also see my image. This is my NAS/Server setup on my home network. It doesn’t look like much but it gives me an additional 12TB storage on a dual link GB LAN network over Cat7 cabling for performance and this is then distributed using three Airport Express access points and an AirPort Extreme Time Capsule Access Point. Short of the long, if I attach this 20TB unit to my NAS setup, I automatically get another 20TB on that NAS setup. It’s that simple and I don’t even have to reformat as it’s shared over SMB 3.0. If you’re telling me that’s a waste of time and money, then you crack on sunshine and have it your way! More and more devices shipping with USB-C. Apple's decision to drop the USB-A connector continues to be affirmed as the right choice. Amateurs can easily rack up TBs of 4K video these days.